Byword text editor for for Mac and iOS has received a major update that has added multiple new features to the App. The most important feature of the newly updated Byword is the ability to publish directly to multiple blogging platforms like WordPress, Tumblr and Blogger. The writing App has been designed to make writing an easier process in Markdown, following which you can preview your documents, export to HTML, PDF or rich text. You can choose your own theme as per your liking between light and dark ones and there are plenty of typefaces. Using the updated App now lests you scroll position on the Markdown preview and copy rich text to keyboard on Mac. Application Sandboxing is also available with the update. Special detailing has been given to the iOS App with major emphasis has been laid on making the offline experience of iOS users. Your documents will now be downloaded automatically when you're connected to Wi-Fi so they're accessible offline. Support will be extended to Dropbox when you're offline, including options to rename, duplicate and delete. 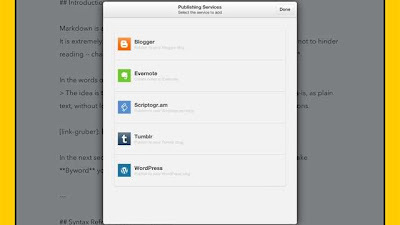 As already written above the update enables publishing to blogging platforms such as WordPress, Tumblr and Blogger. 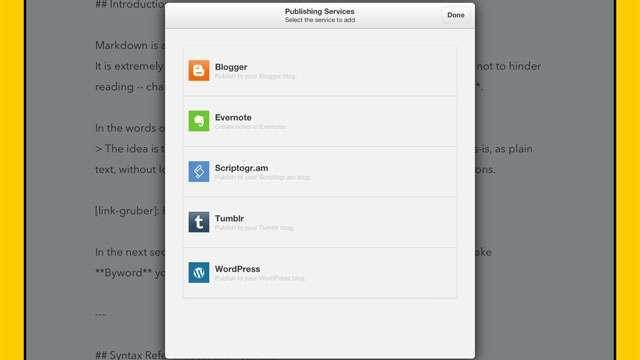 You will also be able to use this App on Evernote and Scriptogram. However the Byword is not free. It comes at $2.99 (Rs.270.00) for iOS version and $9.99 (Rs.550.00) for the Mac version. If you are interested, please download the Byword for iOS from Apple Store here and Byword for Mac from here.